With the number of Agile coaches increasing and with consulting companies pushing their customers to go Agile, many companies (and people) have been frantically engaged in becoming Agile or getting Agile certified. STOP - if you are one of them! THINK for a moment if Agile is really for you, and ask yourself the question "Am I looking at the right solution for my problem?" Agile Software Development is an iterative process that doesn't come without making conscious changes in the way things are done and the way people behave in a software development ecosystem. 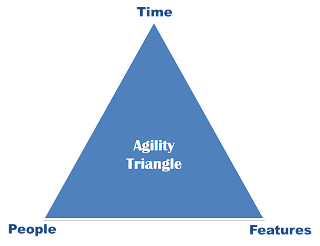 The Agility Triangle [Refer Figure 1] is the way I look at the three key factors of any software development process - People, Time and Features. Any software development process is one that deals with a set of people and a time window to deliver a set of features. The question you've got to ask your organization is simply this - "Can we afford to relatively vary the magnitude of vertexes of the Agile Triangle?". In simpler words, "Does my project or do I have the flexibility to get more people, remove features or add more time on the fly?" If the answer is a Yes, I will say you can consider adopting an Agile software development process. NOTE: This does not, by any means, guarantee you to success with Agile. There is a lot more to Agile than just number of People, Time and Features! Committing to delivering a set of Features in a specific Time interval with a predefined set of People. I hope this comes of use to you. Should you have some inputs to share on this topic, please do leave your comments. Talking about Agile and people, I get reminded of Clint Eastwood's words in the movie Heartbreak Ridge (1986) "You Improvise. You Adapt. You Overcome." Though the word You used in this notable quote refers to Marines, your project is no different! Till I see you the next time with the next article in the series Our Secret Ingredient is Our People, have a wonderful time! As always, Stay Tuned and Stay Inspired! The Agility Triangle is one concept to think about in software development. A team's capability to manipulate any of these factors already determines how far they've reached power as one of the groups in technological advancement.